Heat skillet over high heat, add oil, onion and garlic, cook 1-2 minutes, stirring constantly. Add asparagus, cook 2-3 minutes until it is bright green and crisp tender. Remove from pan and set aside. Add lemon juice and water, scraping bottom of pan to get any bits that are stuck. Add butter and mustard and stir until combined. Add dill and pepper, and additional water to reach desired sauce constancy. 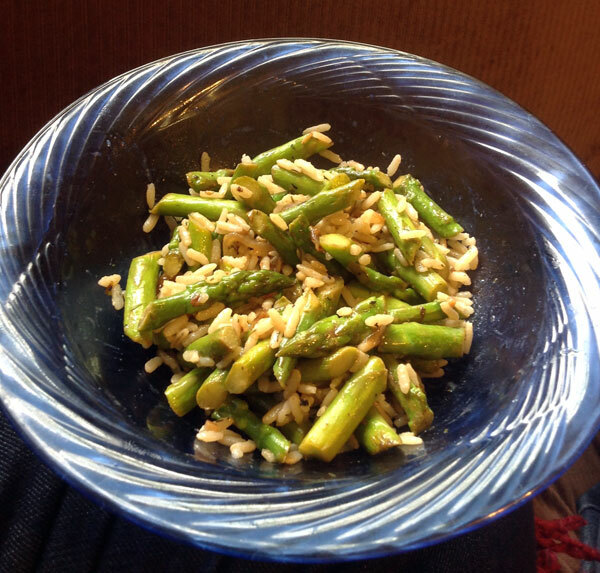 Pour sauce over asparagus mixture and serve over hot rice, or toss with rice. Serve immediately.